It’s finally here. The end of the storyline many people have been dreading since it was announced. 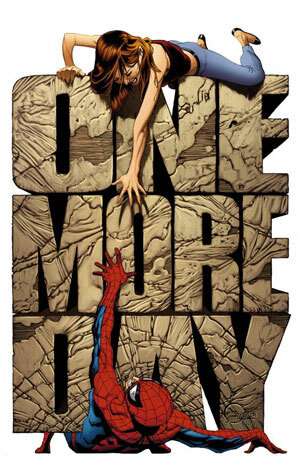 Amazing Spider-Man #545, the final chapter of One More Day. I can’t remember my first Spidey comic but I do know i’ve been following the adventures of the wall crawler for more than two decades. Over the years I’ve spent more money than I care to count on things like toys, statues, Christmas ornaments and a tattoo so I feel safe in saying that I am a Spider-Man fan. Much like many of my friends I have dreaded the One More Day story arc because it was rumored to undo Spider-Man continuity all the way back to 1987 when Pete and MJ tied the knot. I’ll say up front, the rumors are true. The end is nigh (for that whole marriage thing anyway) and an era is truly over. Now the questions I keep asking are “why?” and “what does this mean?” The why of it is pretty straightforward. The decision to dissolve Spider-Man’s marriage came down from editorial, specifically from Joe Quesada. There are valid arguments to be made that storylines that come from an editorial directive and not grown organically out of the story itself are almost always bad. I don’t disagree with that and I won’t try to defend it. So why review this book if I disliked it so much? Well, I didn’t dislike the book so much as how it came about. The Mephisto cheat seemed like a bit of a cop out especially when you stack it up against the theory Phillip had been floating around the shop about Loki. Logically having Loki make the changes to the universe would have been a great way to tie Straczynski’s run together. Perhaps when the time comes to change things back editorial will go that route. Enough with the grousing, there were a few things in there that I really liked. First I have to give Joe Q as much credit as blame here as his artwork is some of the best of his career. I can’t imagine the number of things he has to do in a day and yet he managed to put together a book that was not just good but actually beautiful in places. The use of shadows to portray Mary Jane’s anguish was a particularly nice touch. The last time I recall Mephisto looking this evil and creepy is in that ten year old kid that lives in the back of my brain place where I remember the first time I saw the devil in a comic book. I have to lay some of the praise on Danny Miki for the atmosphere in the book. There is a marked difference between the parts that Miki inked and the part after Mephisto initiates the big change where Joe inks his own. I think it was a smart decision on the part of the artists because whether it was due to time constraints or because they wanted a brighter look for the “Brand New Day” portion of the book it worked like a charm. The resolution here brings up a multitude of “what happens now” questions along with a long dead old friend. I can definitely see the storytelling potential for the future. I went into this issue with more than a little trepidation but I’m actually kind of looking forward to what this “Brand New Day” will bring. I hated that Aunt May was brought back from the dead at the end of the clone saga (another editorial decision that had nothing to do with story) but it gave us some of JMS’s finest moments as Aunt May dealt with Peter being Spider-Man. I can understand why some people are frustrated with this new era of Spider-Books but when I look at the amazing (no pun intended) array of talent coming to the title I can’t help but be a little excited. This entry was posted in Comics, Features and tagged Comics, redheads, satan, Spider-Man. Bookmark the permalink.